In-flight Refueling For Commercial Airlines? 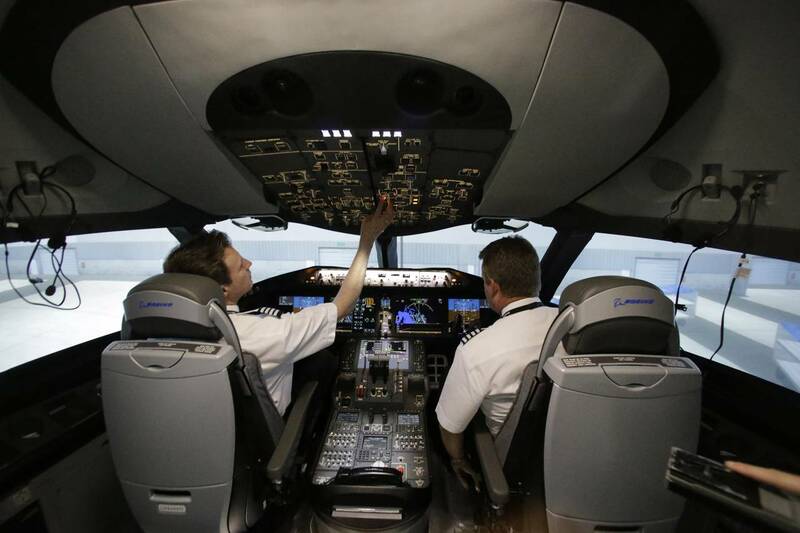 Pilots work inside a Boeing 787 flight simulator in Fort Worth, Texas, in May 2014. MADRID-A senior Airbus Group NV safety official has urged revamping pilot training world-wide, in one of the most forceful industry warnings to date about the dangers of undue reliance on aircraft automation. Addressing an international conference of pilot-union leaders here Saturday, Harry Nelson, a high-level company safety expert and former vice president of the European jet maker's flight test department, called for fundamental changes to improve manual-flying proficiency and other cockpit skills that have been de-emphasized over the years. Other industry managers as well as pilot leaders have been moving gradually in the same direction by encouraging more practice of manual aircraft-handling skills in simulators, and even during some regular passenger flights when the weather is good and the airspace isn't busy. But Mr. Nelson was unusually blunt in calling for substantially more effort in this area, while highlighting broader shortcomings of current training. He contends today's practices tend to be too boring and predictable for pilots, with rote simulator sessions often disconnected from actual flying experiences. Perhaps most important, Mr. Nelson told roughly 600 pilots from around the globe that too many veteran aviators have come to view recurrent training sessions as an unwelcome annual or semiannual chore that can endanger their jobs if they perform poorly-rather than an opportunity to fine-tune skills, improve decision making and learn new safety concepts using increasingly realistic simulator technology. For pilots in the middle of their careers "there is no perceived upside to the training," he said. "And that's wrong." Mr. Nelson's comments amount to a striking criticism of many pilot training principles that airlines have relied on for decades, and which helped usher in the safest period in commercial aviation globally. The speech was especially telling because Airbus, more than rival Boeing Co., has built its reputation and product line around increasingly advanced uses of automation to guard against accidents. But Mr. Nelson stressed his criticism wasn't directed at any particular airline or type of jetliner. His views are shared, to some extent, by other safety experts. After learning the details of automation, pilots in the last few years have been encouraged to concentrate more on hand flying plus mastering the intricacies of switching between manual control and various levels of automation. Those are the issues "we're going to start practicing more and more, the transitioning in and out of these phases," Tim Canoll, the new president of the largest North American pilot union, said in an interview during the conference. The impetus for change, according to Joe DePete, a FedEx Corp. captain who serves as the union's top safety official, was when "we started to see tendencies and trends" indicating erosion of basic flying skills. So in recent years many airlines started explicitly telling crews to manually fly aircraft under appropriate circumstances. "Now, we really focus on those hand-flying skills, and we encourage people to do it," he said. All that, however, may be inadequate considering the industry's previous alleged infatuation with automation. In 2013 a U.S. government-commissioned study prepared by nearly three dozen international safety experts concluded that excessive pilot dependence on automation, combined with failures to master the latest cockpit technology, posed the greatest hazards to passengers. According to accidents and incidents analyzed by study participants, pilots frequently were reluctant to intervene to resolve automation problems, partly because "training methods, training devices and the time allotted for training" may have been inadequate. The Federal Aviation Administration has embraced many of the report's conclusions and taken steps to implement them. But despite the airline industry's accomplishments, according to Mr. Nelson, carriers, plane makers and training organizations still have a long way to go to fully recognize the importance of training pilots to cope with extreme maneuvers or emergency scenarios intended to stretch their professional skills. Frequently, he told the audience, trainers focus too much on complying with regulatory requirements instead of teaching pilots new safety approaches and helping them become more resilient confronting one-of-a-kind emergencies. "We do a lot of checking" of the same required maneuvers and emergency procedures each year, Mr. Nelson said, "but we don't do much teaching." A shift in emphasis would require airlines to rewrite reigning curricula; and unless some existing practices are eliminated, the result could entail extra costs by extending total annual training hours per pilot. Another issue Mr. Nelson raised could be equally thorny. As planes get ever more reliable and older generations of trainers with strong manual flying skills retire, their replacements typically lack comparable experience dealing with real-life emergencies. That is because dangerous malfunctions and close calls are much less frequent now than they were in earlier decades. "Tomorrow's instructors will not be teaching from personal exposure" to emergencies that required pilot interventions, Mr. Nelson said. "They'll be speaking from hearsay." As the dependability and sophistication of engines and flight-control systems continue to improve-making automation a major driver of safer skies-airline pilots spend the vast majority of their flying hours programming and monitoring onboard systems. During most trips, manual flying is relegated to barely a few minutes during takeoffs and right before touchdowns. Now, Mr. Nelson and other experts are spending considerable time documenting some of automation's downsides, including low morale among many aviators. "It used to be cool to be a pilot," Mr. Nelson said Saturday. But these days "for a lot of pilots it's just another job," he said, adding that such attitudes provide further impediments to lifelong learning. The remains of a plane are towed away the day after it crashed May 27, 2013. Nearly two years after a small plane crashed into a south Bibb County swamp, investigators don't know much more about what happened to the engine than they did the night of the crash. Pilot Tony Cabeza noticed a drop in oil pressure and asked to land at Middle Georgia Regional Airport on May 27, 2013. The 58-year-old, an experienced airline transport pilot, was cleared to runway 23, and Robins Air Force Base was notified that the plane would be flying through its airspace. With the Macon landing strip in Cabeza's sight, the controller asked if he needed further assistance. "Not at this time," Cabeza replied. By the time he made first contact with the Macon tower, the Piper PA-32R-300 had lost power. Cabeza asked to land at Robins and was told to contact the base tower. No one heard from him again. The Robins tower could see smoke rising from less than a mile away. Cabeza and his 71-year-old passenger, Julius Gilreath, who was also a pilot, died at the scene. The 1976 four-seater plane crashed eight-tenths of a mile north of the Robins runway and about three miles from the regional airport. Both men died of multiple blunt trauma, according to GBI autopsies. A post-crash fire damaged the cockpit, forward cabin and left wing. It was just after 6 p.m. Memorial Day when Houston County firefighters learned of the crash, which was actually just across the Bibb County line. Field training officer Matt Hancock was one of the first on the scene. "I was familiar with the area," he said. Large trees had been harvested two to four years earlier. "It was flooded over from where the river floods," said Hancock. "Some places it was chest high, but mostly around your waist. Snakes were running around out there. We kept on moving. They did not bother us." A crew of nearly a dozen first responders lugging rescue equipment trudged their way through the murky water, continually encountering submerged stumps. The plane was smoldering by the time they got to it. A couple of blasts from fire extinguishers put it out. From what Hancock could tell, the plane came in at an angle, hit a stump and came to rest on the ground. Crews coming in from Bibb County took three hours to cut a path to the wreckage and remove the bodies. Since then, investigators from the National Transportation Safety Board have been examining the plane to determine what caused the catastrophic failure. In a report issued this week, the NTSB determined that "oil starvation" caused the engine failure. At Lowe Aviation at Middle Georgia Airport, Henry Lowe said a drastic loss in oil pressure can happen for a variety of reasons, from a leak to an unseen problem inside the engine. "After the oil pressure goes down, you don't have long," Lowe said. The NTSB report noted a near-complete obstruction of the oil suction screen and evidence of metal debris, which could indicate the blockage choked off the oil supply, Lowe said. The investigation's review of maintenance records shows airworthiness directives for replacement of the oil cooler hose and oil filter converter plate gasket were not done, but no specific conclusion was noted about what impact, if any, that might have had. "Extensive post-crash fire and heat damage to the engine components precluded a determination of the cause of the oil starvation," the report stated. The Federal Aviation Administration is stepping up oversight of United Airlines. The Federal Aviation Administration has stepped up its oversight of United Airlines (NYSE: UAL) and its pilots, according to a report in today's Wall Street Journal. The Journal said the FAA also has called for Chicago-based United to revamp parts of its process for qualifying crew members in the wake of several mid-air incidents, including one in which pilots had to implement an emergency pull-up to avoid crashing into the ground. The FAA's increased oversight of United apparently also comes at a time of tense relations with the airline's approximately 12,000 pilots, many of whom have issues with United management over matters ranging from retirements to new hires. United has a history of contentious relations with its pilots since United and Continental announced their merger in 2010. Many months of difficult negotiations with the pilots from two airlines with vastly different cultures followed the merger announcement. But the pilots from both carriers now work under a joint contract and a single seniority list. United reportedly has informed the FAA of how it plans to address safety matters, but the FAA is said still to be reviewing the carrier's response. News of the FAA's ongoing concerns about United safety issues comes in the wake of March operations report yesterday that showed the carrier's traffic across the Atlantic - normally a busy route - falling in March of this year compared to a year ago. Traffic on United's vast network of regional carrier partners also dropped a whopping 9.3 percent year over year in March. 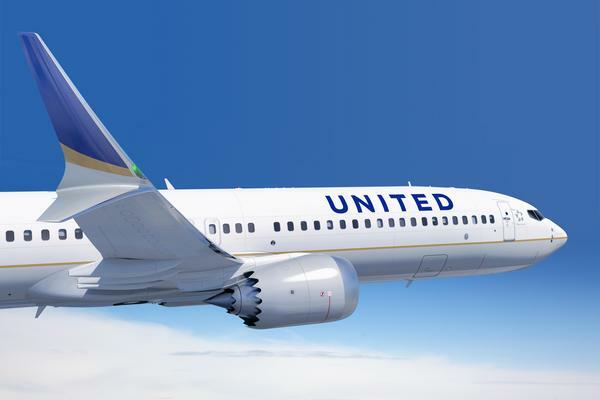 A United spokesman yesterday said the sharp falloff in regional traffic was attributable in part to a change in aircraft type on many United routes served by its United Express regional partner carriers. Chicago-based United Airlines has outlined a plan for aviation regulators on how it will deal with concerns involving pilot training and scheduling, and is implementing those changes. The airline in a March 25 letter responded to Federal Aviation Administration concerns by outlining its corrective actions, according to United, which would not detail what the issues were or release the letter. United self-reported the infractions as part of an FAA program called the Safety Management System, aimed at heading off problems before they become serious enough to warrant enforcement action, such as fines. Airlines voluntarily report the problems and fix them to avoid penalties. Such back-and-forth between airlines and the FAA generally does not become public. The FAA on Friday downplayed the significance of its letter to United about the concerns, calling it "a routine communication about issues arising during our evaluation of their voluntary disclosures." The communication came to light in a Wall Street Journal story that said the FAA in the Feb. 6 letter to United's top safety office was concerned with "repeated violations of mandatory pilot qualification and scheduling requirements." It provided no details, although it cited 12 violations over 13 months. General examples of such issues are pilots flying longer than the maximum they are allowed to by FAA regulations or missing deadlines for periodic training. "At the request of the FAA, we provided a full outline of our corrective actions," United said in a statement. "We continue to believe the FAA's safety management system programs are the best solution to identifying any issues and addressing them to ensure the safety of our customers and employees." United called the disclosures "part of a healthy and open safety dialogue between United, our employees and the FAA." "As a result of this dialogue and our commitment to the FAA's (Safety Management System) program, information sharing and collaboration on safety issues is as transparent as it has ever been," United said. "This environment of openness, fostered by safety management system programs, has contributed to the advances in safety across the industry in recent years." A United spokeswoman said the airlines is in the process of implementing the changes it outlined to the FAA. United's pilot union, Air Line Pilots Association, would only say it is committed to safety "in all things." "The pilots of United Airlines are leaders in aviation safety and put safety above all else," Capt. Jay Heppner, chairman of the union's master executive council. "We will continue to assist our company in correcting any safety deficiencies as they are discovered." The news comes after United issued a stern and blunt bulletin to its pilots Jan. 9, expressing concerns over safety. It called for stricter compliance with cockpit rules and procedures and cited several serious incidents caused by cockpit errors. The February FAA letter doesn't mention those concerns but instead covers areas such as pilot records and crew-member qualifications, according to the Journal. Four people aboard a small Fort Lauderdale-bound plane died Sunday when the aircraft crashed and incinerated in a nature preserve near Fort Lauderdale Executive Airport. The Piper PA-31 aircraft, which had departed from Orlando, was attempting to make an emergency landing for unknown reasons, and plunged into the ground from an altitude of 8,000 ft., killing the four people on the plane, the Sun-Sentinel reported. "It nosedived right into the floor. It sounded like a semitruck hit a wall, it was so loud," eyewitness Bobby Bemis told NBC Miami. The plane was soon engulfed in flames in a wooded area north of the airport, prompting Florida fire teams to rush to the scene. "Our crews made an aggressive attack on the fire, extinguished the fire within minutes," Fort Lauderdale Fire Rescue's Chantal Botting told the Sun-Sentinel. Names of the victims have not been released yet. No ground injuries were reported and the airport remains open. KATHMANDU, APR 12 - A mission from the European Aviation Safety Agency (EASA) will be providing technical assistance to Nepal to support its efforts to remove the significant safety concern (SSC) tag given by the International Civil Aviation Organization (Icao). 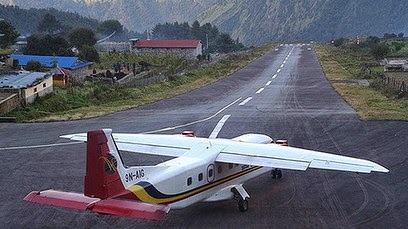 According to the Civil Aviation Authority of Nepal (Caan), a five-member team is scheduled to arrive on May 4. It will assist Nepal to resolve the deficiencies pointed out by the global aviation watchdog and support the corrective measures adopted by Caan to ensure safety. Icao monitors Nepal's aviation safety oversight capabilities through the Icao Coordinated Validation Missions (ICVM). International airlines and travellers hesitate to travel to a country whose air safety has been questioned by Icao. On December 5, 2013, the European Commission (EC) had put all Nepali carriers in its bad books for the worst record of air safety oversight based on Icao's safety audit. The EC has asked European operators and travel agents to inform European travellers who will have a right to reimbursement if they had booked a seat on a Nepali carrier as part of a journey to Nepal and decide not to use it. The travel advisory by the EC warning its citizens not to fly on Nepali airlines dealt a severe blow to Nepal's tourism. Domestic airlines operators said that the EC, which has blacklisted Nepali carriers for being unsafe, has deterred travellers from using domestic airlines. Japan and South Korea recently decided to block new flights from Thai-registered airlines after similar safety concerns were raised by Icao. An Icao mission had visited Nepal in July last year to validate the corrective measures taken by the country to address the deficiencies pointed out by the global aviation watchdog in 2009. The mission carried out an on-site audit from July 10-16, 2013. Unsatisfied with Nepal's progress, Icao had given the SSC tag to Nepal's aviation sector in its audit report in August 2013. Icao has grave concerns about Nepal's air safety, and has placed it among the 12 worst performing nations. "We have planned to invite the Icao revalidation mission by December this year. By this time, Nepal should have addressed all the deficiencies pointed out in its audit report," said a Caan official. The mission is normally invited by a state when it is fully confident that it has fulfilled all the compliances with international safety standards. Caan officials claimed that significant improvements had been made in pilot licensing and air operators' certificate (AOC) requirement, the major safety concerns pointed out by the audit. "The Icao re-validation mission will be crucial as we won't be able to remove Nepali carriers from the EC's blacklist unless the SSC is eliminated," the official said. Nepal has performed poorly in effectively implementing air safety oversight systems, appearing way down in the 37th position out of 46 Asian countries, according to the safety audit report of Icao. The audit report shows that Nepal has received a rating of 55.1 percent, much below the Asian average. However, Nepal trails behind Sri Lanka (87.3 percent), Pakistan (84.6 percent) and India (79.1 percent). Problems with regulators and safety training point to where the problem starts here, and that's with airline leadership too eager to expand and governments that to inept or outclassed to do their duty for passengers. For Asia's aviation industry, the growing pains have just begun. A year of disasters, the disappearance of Flight 370 and financial turbulence highlight the challenges confronting the world's biggest air travel market, where governments, regulators and airlines are struggling to keep up after a decade of astonishing growth. A U.N. agency's warning about airline safety in Thailand, one of the world's top tourist destinations, is just the latest sign of ferment in the industry. The boom has been driven by the region's explosive economic growth as well as market liberalizations that have allowed dozens of new discount carriers to flourish, turning the airline business on its head. The strains are also showing in recurring pilot shortages and shortcomings in air traffic control systems and airport infrastructure that countries are scrambling to upgrade, especially in big Southeast Asian nations such as Indonesia. "We're in uncharted waters," said Desmond Ross, principal at DRA International aviation consultants and former head of the Pacific Aviation Safety Office, which oversees airline safety for South Pacific islands. "I don't think the world has seen this sort of growth before." A third of airplane accidents in the Asia-Pacific region from 2008 to 2012 "involved deficiencies in regulatory oversight," the International Civil Aviation Organization said in a report this year. Another 27 percent involved "deficiencies in safety management." Meanwhile, the agency's recent audit of Thailand has produced disquieting revelations about what lies below the surface of a country that has marketed itself to the world as a safe and welcoming destination. The agency informed governments in March of "significant safety concerns," prompting several Asian nations to step up inspections of Thai airlines or block them from launching new flights and modifying schedules. The leader of Thailand's military government, which ousted its civilian predecessor in a coup last year, blamed years of neglect for allowing problems to accumulate to a critical mass. He said the civil aviation department has only 12 inspectors, a figure unchanged for years despite huge growth in tourism. The dictator has vowed to use his authoritarian powers to overhaul aviation, but it's unclear whether sweeping changes can be implemented fast enough to avoid a damaging downgrade of Thailand's safety rating. Ross said Thailand's problems are not unique and stem from the "superfast expansion that's been taking place over the last 10 years." Aside from hurting tourism, the ICAO warning could also prompt insurance companies to raise their rates for airlines operating in Thailand. Passenger numbers in Asia-Pacific have risen by a third over the past five years to 1.1 billion, and the region now accounts for 33 percent of global air passenger traffic, according to the International Air Transport Association. That proportion is forecast to grow to 42 percent within the next two decades as an extra 1.8 billion passengers take to the skies. Another big source of concern is Indonesia, where in December an AirAsia jet carrying 162 people plummeted into the sea as it ran into stormy weather on its way from Surabaya to Singapore. The disaster, which was the first ever fatal plane crash for the popular budget operator, was one of five suffered by Asian carriers in a 12-month span. The flight itself was unauthorized by Indonesian authorities, showing up laxness in its aviation oversight. Flying is often the easiest travel option in Indonesia, a sprawling archipelago of 17,000 islands that's home to 250 million people. IATA is worried that regulations and infrastructure aren't being updated fast enough to keep pace with Indonesia's expansion. The Southeast Asian country's air travel market is forecast to triple over the next 20 years to 270 million passengers, making it the world's sixth biggest. "I am very concerned about safety in Indonesia," IATA director general and former Cathay Pacific Airways CEO Tony Tyler said in a speech to Indonesian aviation officials in Jakarta last month. He noted the country has had at least one crash in which a plane has been written off every year since 2010. "There is a safety problem here," he said. "It's not going to solve itself." Tyler pointed out that the country needs to upgrade its air traffic management system to cope with the rising number of aircraft in the skies and future increases. Airlines have more than 800 new aircraft on order. Despite the high profile of airline disasters in 2014, stemming in part from the double Malaysia Airlines tragedies, the airline industry asserts it was a relatively safe year for flying. The total of 12 fatal accidents was below the five-year average of 19 and so called "hull losses," the write-off of airplanes from accidents fatal or nonfatal, was its lowest ever. From another perspective, however, it was a particularly tragic year. Including Flight 17 shot down over Ukraine which isn't included in the industry's accident tally, 939 people were killed in planes last year compared with 210 the previous year. But what experts say is most relevant is whether safety will be compromised as air travel expands relentlessly in a region where countries range from advanced to among the world's poorest with huge differences in capacity to manage the safety of their air space. "I think we're at a turning point where we either maintain this relatively good level of safety" in Asia "or it declines," said Ross. Discount carriers account for about 60 percent of Asia's passenger capacity, up from nearly nothing a decade ago, according to CAPA-Center For Aviation. Asian airlines have about 1,600 aircraft on order, more than are in operation, according to the group, including more than 500 ordered by Indonesia's Lion Air, which is barred from flying into European Union airspace. The surge in jet numbers is also choking major air corridors and taxing air traffic controllers. The recent disasters have led to renewed calls for reforms to unify fragmented safety regulations in Southeast Asia. The official report on the disappearance of Malaysia Airlines Flight 370 released in March illustrated the need to bring standards in line, said Shukor Yusof, founder of Malaysia-based aviation research firm Endau Analytics. 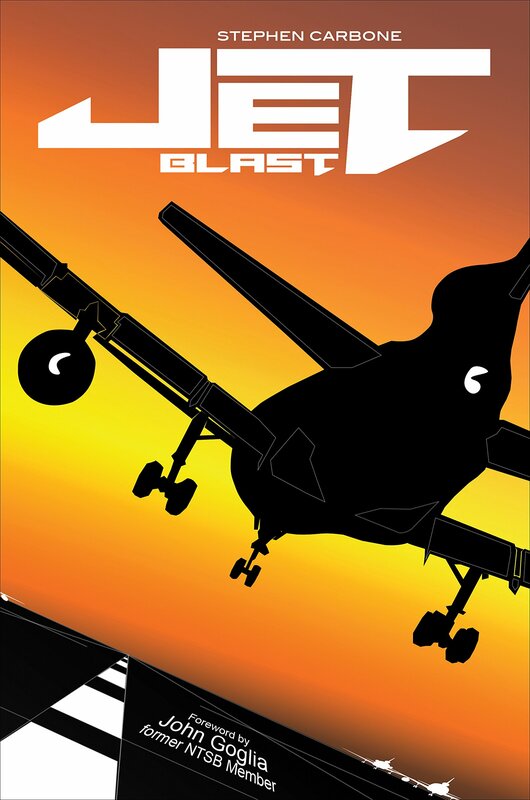 The transcript of the chatter reveals confusion between air traffic controllers in two countries as they struggle over several hours to deal with the plane's unexpected disappearance. At one point five hours after the last transmission from the Boeing 777, Malaysian and Vietnamese air traffic controllers misunderstand each other as they try to establish if search and rescue operations have been launched. The transcript shows how the miscommunications "contributed to the chaos," said Shukor. There's now "more urgency" to have a single Southeast Asian safety framework given that so many more airplanes are crossing between national air control zones. "The airspace is getting congested," he said. KUALA LUMPUR, Malaysia - Efforts to save Malaysia Airlines (MAS) need to begin with downsizing its staff to make it competitive, said Maybank Investment Bank aviation analyst Mohsin Aziz. The plan by MAS to retrench 6,000 workers out of its total workforce of 20,000 is critical to the national carrier's survival, and as part of its recovery plan, the ending of unprofitable routes and services would unavoidably result in the termination of redundant staff, he said. But the most critical issue, he said, is MAS's own survival, adding this is the right time to continue with measures that have been postponed for so long. "What is more important is that we need to do it now, it cannot be postponed any longer, otherwise the airline will not recover and will be in worse shape," he said. Mohsin said compared with other airlines, MAS is overly burdened with problems with its workers unions that affect its commercial performance, pointing out that bitter and unpopular sacrifices have to be made in the commercial interest. "Many other companies have undergone a retrenchment process, banks such as CIMB and others, oil and gas firms such as Petronas, and subsidiaries in the vendor system are going through the same process. "And telecommunications companies such as Maxis, DiGi and Celcom have also gone through it several times, so this is normal practice among commercial companies, and Malaysia Airlines is a commercial company." Asked on the willingness of AirAsia to take in some of the MAS staff to be retrenched, Mohshin said in 2002, 2003 and 2004, nearly 90% of its workers were ex-MAS employees. "And the new airline Malindo is also going through the same phenomenon, many of its workers are from MAS and AirAsia," he said, adding workers with marketable skills can job hop with few problems. Mohsin said fewer aircraft and workers would be needed with the axing of unprofitable routes, such as to Europe and the Middle East, and the possibility of cutting down the flight frequencies on many Asian services. "For MAS this is a question of life and death. The people are tired of hearing another restructuring every two to three years, so I think this would be the last one. "It's the last chance and if this ends in failure, then you probably need to rebuild. What is clear is that we cannot repeat the same thing over and over," he said. Asked on the challenges facing new MAS chief executive officer Christoph Mueller, Mohsin said teamwork is essential for any organisation, whether it has 10 or 10,000 workers, and that Mueller needs to ensure staff at all levels work as a team with the same objective, and that any one who refuses to do so will have to be terminated. "The reason that we felt we had to start running these ads is the president and the Congress have been irresponsible and - we believe - operating illegally and immorally to let these drone attacks continue," said Nick Mottern, of the group KnowDrones, the lead group behind the effort. "We felt that we had to speak directly to the people who were being ordered to do the killing because, at this point, it seems they're the only ones who can put a stop to this." The commercials aired near Creech Air Force Base, Nevada, in March and they have aired near Beale for the past week, Mottern told Air Force Times. Beale is home to the 9th Reconnaissance Wing, which includes RQ-4 Global Hawks - surveillance drones that fly at high altitudes but are not armed. Two versions of the commercials are currently airing, both 15 seconds long, the Sacramento Bee first reported on Thursday. In one version, a narrator says, "U.S. drones have murdered thousands, including women and children." Both commercials end with the narrator saying, "Drone pilots: Please refuse to fly," along with the words "No one has to obey an immoral law" printed on the screen. KnowDrones plans to raise money to air the commercials around other active-duty and Air National Guard bases, including Hancock Field Air National Guard Base, New York; and Horsham Air Guard Station, Pennsylvania. Mottern is a Navy veteran who was stationed in in Saigon in 1962 and 1963, but he never saw combat, he said. He left the Navy as a lieutenant, junior grade. One reason why his group opposes drone strikes is that unlike manned aircraft, drones have unmatched power to put targets under constant surveillance, he said. "When you're using that kind of a weapon that relies on surveillance, it means that, first of all, you're violating the privacy of many people - a village, a whole region," Mottern said. "That kind of violation is totally against international law. It's against the universal declaration of human rights that was approved by the United Nations. Even before the killing occurs, you have a situation people's rights have been profoundly violated." Another issue is that the people drones put under surveillance are often "targeted for assassination" without due process, he said. "These, I would say, executions, without the benefit of any inquiry in a legal way or a court proceeding," Mottern said. When asked about the commercials on Thursday, Air Combat Command issued a terse statement: "This organization is entitled to express their opinion." One drone pilot, who asked not to be identified, told Air Force Times that drone strikes represent a tremendous advance in air warfare since World War II and Vietnam, when U.S. bombers would have to drop tons of ordnance to take out one target. "We literally can surgically and precisely take out individual people, or small groups of people, among the civilian population," the pilot said on Thursday. The pilot says he is very comfortable with the work that he does. "I guarantee that my family and your family are much safer for the work we've done [rather] than allowing the terrorists to operate freely in their little safe havens," the pilot said. "The work that we have provided has been very, very detrimental to their ability to operate and attack us on our homeland." When the U.S. has not taken the fight to the enemy in the past, it has only invited aggression, he said. There are two alternatives to using drones, the pilot said: The U.S. can either start using less precise weapons that will inadvertently kill a lot of people, or the U.S. can fight the terrorists in the homeland. "Pick your poison, people," he said. Boeing has landed a blockbuster 61-jet order from Copa Airlines of Panama. The order would be worth $6.6 billion at list prices, though big airlines receive significant discounts on such orders. The deal was announced on the sidelines of the Summit of the Americas, a gathering of North and South American leaders that's being hosted this year in Panama's capital city. Copa CEO Pedro Heilbron and Boeing CEO Jim McNerney signed off on the order for 61 Boeing 737-MAX jets at a Friday ceremony attended by President Barack Obama and Panamanian President Carlos Varela. Trade officials said the deal is the biggest ever between U.S. and Panamanian companies. Copa has long been a staunch Boeing customer. The carrier's current fleet of 98 aircraft includes 72 Boeing 737 jets of various models, according to the carrier's website. The remaining planes in Copa's fleets are mid-size E190 jets made by Brazilian manufacturer Embraer. The Copa order announced Friday with Boeing is for the 737 MAX, a "next generation" update to Boeing's best-selling model. The aircraft, scheduled to debut in 2017, includes newer fuel-efficient engines as well as other design updates. John Riggin v-p and general manager of Jet Aviation Singapore said the company has expanded the facility's size and the capability of its cabin interiors design operations. The Macau Airport Authority has awarded Jet Aviation a 10-year concession to operate a new business aviation maintenance facility at Macau International Airport. The Swiss-based group also announced today that it is further expanding the capability of its Singapore facility. Operations in the new Jet Aviation Macau maintenance, repair and overhaul (MRO) facility will begin in August 2015. The company is leasing half of a new 8,000 square meter (86,000 sq ft) hangar, plus an additional 1,000 square meters (10,764 sq ft) of workshops and office space. The facility is adjacent to Macau's new FBO, which is run by the airport authority. The new location will supplement the work of Jet Aviation's existing MRO operation in Hong Kong, which is an authorized service center (ASC) for both Gulfstream and Dassault aircraft. The company will extend its European and U.S. Part 145 approvals to the new facility, as well as securing the same authorization from the Macau authorities. Jet Aviation's Hong Kong facility also provides line support for Bombardier Challenger and Global Express aircraft, and employs some 60 people. However, with business aircraft operators still facing difficulties getting landing slots at Hong Kong International Airport, the company has been eager to establish an alternative base for supporting aircraft operating in and out of Greater China. Meanwhile, Jet Aviation's facility at Singapore's Seletar Airport has received approval from the U.S. Federal Aviation Administration (FAA) for a new cabin interiors workshop. The company has doubled the size of its team of craftsmen providing extensive refurbishments of business aircraft, and can now handle warranty repair work. The Singapore facility is currently working on a Bombardier Challenger 605 and a Gulfstream GIV to complete, respectively, a full cabinetry and veneer refurbishment, and a cabin interior upgrade. Last year, it completed several projects including a full interior refurbishment for a GIV and interior component retrofits on a pair of VIP-configured Boeing 747s. "We're developing a reputation as a one-stop-shop with our combined maintenance inspection and refurbishment offering, including upholstery and avionics or cabin management upgrades," said John Riggir, vice president and general manager of Jet Aviation Singapore. "We have experienced increased demand from the maturing fleet of long-range, large cabin aircraft that are based in Hong Kong, Singapore, Malaysia, Thailand and Indonesia. We also expect to receive certification from the Civil Aviation Administration of China later this year, which will further support our customers." The expanded Singapore interiors facility includes a new eco-friendly spray-painting and buffing shop. Jet Aviation works with Hawker Pacific to provide full repaint services for aircraft up to the size of the Gulfstream G650 and the Bombardier Global family. Separately, Jet Aviation Singapore has received FAA approval to provide line and base maintenance for the G650. It has also just won repair station approval from Thailand's aviation authorities. The facility is an ASC and warranty repair site for Gulfstream aircraft, as well as being an ASC for the Nextant 400XT and a line maintenance station for Boeing Business Jets. It also supports numerous Bombardier models. By the end of May, Jet Aviation will add two Hong Kong-based G650ER aircraft to its managed fleet. This will mean that it operates seven G650s under management contracts across Europe, the Middle East, Africa and Asia. In total, the company now has 30 aircraft under management that are based in Hong Kong, and several of these are managed for Chinese owners. Last year, Jet Aviation completed an expansion and modernization of its Seletar FBO, which it opened back in 1995. It can now offer more ramp and hangar parking for the growing number of business aircraft using the airport. "We expect to see our handling business increase further in 2015 now that the construction work is complete, and we are also seeing an increase in the average size of aircraft we support," said Stefan Benz, Jet Aviation's vice president for MROs and FBOs. "With the significant expansion we have completed in Singapore, we are now offering a truly integrated service model for operators from right across the Asia Pacific region." The world's largest aircraft has touched down at Shannon Airport. The Antonov 225, which was built to carry a Soviet Union space shuttle between launch and landing sites, landed for a transit stop at 2.45am Sunday morning from Bangor International Airport, Maine, US. The aircraft is due to depart at 10pm for Ch�teauroux Airport, France. It has a wingspan wider than the Croke Park pitch and, from nose to tail, is more than one and a half times the length of an Olympic swimming pool. Due to the length of its runway - the longest in Ireland - Shannon is the only Irish Airport that the airplane, known as Myria (Ukrainian for "dream") has landed at. "It's an incredible aircraft and when you see it on the taxiway here and can put its size into perspective, it's almost unbelievable that it can get up into the skies, let alone be as graceful when it's up there," said Niall Maloney, Shannon Airport Operations Director. "Last time it was here, in 2013, it landed during daylight hours and there were hundreds if not a couple of thousand people who came to see it. People stood on the roofs of vans just to be able to video it landing. "This time around it arrived in the middle of the night and we still had up to 20 cars loads of people in the viewing area ahead of arrival. There was only one Antonov 225 made and this is it so when it comes here people are very keen to see it. We love having it here. The excitement around its presence is great and creates a great buzz. We have people coming and going all day to see it." Stepping off an airplane at Narita International airport in Japan might be even more frenetic than your usual travel experience-because you'll be racing along a running track. A nice nod to the forthcoming 2020 Olympic Games in Tokyo, the airport terminal walkways use color-coded paths that look like racetrack lanes to guide people as they navigate the space. In fact, the project is designed to help accommodate the increased footfall in 2020 by making it easier to find your way in the airport. It's pretty simple: blue leads people to departures, red takes them to arrivals. There's real pressure on the aviation industry to introduce faster, cheaper and greener aircraft, while maintaining the high safety standards demanded of airlines worldwide. Airlines carry more than three billion passengers each year, which presents an enormous challenge not only for aircraft manufacturers but for the civil aviation infrastructure that makes this extraordinary annual mass-migration possible. Many international airports are close to or already at capacity. The International Air Transport Association (IATA) has estimated that, without intervention, many global airports - including major hubs such as London Heathrow, Amsterdam Schiphol, Beijing and Dubai - will have run out of runway or terminal capacity by 2020. The obvious approach to tackling this problem is to extend and enlarge airport runways and terminals - such as the long-proposed third runway at London Heathrow. However there may be other less conventional alternatives, such as introducing in-flight refueling for civil aircraft on key long-haul routes. Our project, Research on a Cruiser-Enabled Air Transport Environment (Recreate), began in 2011 to evaluate whether this was something that could prove a viable, and far cheaper, solution. If in-flight refuelling seems implausible, it's worth remembering that it was first trialed in the 1920s, and the military has continued to develop the technology ever since. The appeal is partly to reduce the aircraft's weight on take-off, allowing it to carry additional payload, and partly to extend its flight range. Notably, during the Falklands War in 1982 RAF Vulcan bombers used in-flight refueling to stage what was at the time the longest bombing mission ever, flying 8,000 miles non-stop from Ascension Island in the South Atlantic to the Falklands and back. Reducing take-off weight could offer many benefits for civilian aircraft too. Without the need to carry so much fuel the aircraft can be smaller, which means less noise on take-off and landing and shorter runways. This opens up the network of smaller regional airports as new potential sites for long-haul routes, relieving pressure on the major hubs that are straining at the seams. There are environmental benefits too, as a smaller, lighter aircraft requires less fuel to reach its destination. Our initial estimates from air traffic simulations demonstrate that it's possible to reduce fuel burn by up to 11% over today's technology by simply replacing existing global long-haul flight routes with specifically designed 250-seater aircraft with a range of 6,000nm after one refueling - roughly the distance from London to Hong Kong. This saving could potentially grow to 23% with further efficiencies, all while carrying the same number of passengers the same distance as is possible with the current aircraft fleet, and despite the additional fuel burn of the tanker aircraft. However, this is not the whole picture - in-flight refueling will require the aerial equivalent of petrol stations in order to deliver keep passenger aircraft in the sky. With so much traffic it simply wouldn't be possible to refuel any aircraft any time, anywhere it was needed. The location of these refueling zones, coupled with the flight distance between the origin and destination airports can greatly affect the potential benefits achievable, possibly pulling flights away from their shortest route, and even making refueling on some routes impossible - if for example the deviation to the nearest refueling zone meant burning as much fuel as would have been saved. As with all new concepts - particularly those that involve bringing one aircraft packed with people and another full of fuel into close proximity during flight - it's quite right to ask whether this is safe. To try and answer this question, the Dutch National Aerospace Laboratory and German Aerospace Centre used their flight simulators to test the automated in-flight refuelling flight control system developed as part of the Recreate project. One simulator replicated the maneuver from the point of view of the tanker equipped with an in-flight refuelling boom, the other simulated the aircraft being refuelled mid-flight. Critical test situations such as engine failure, high air turbulence and gusts of wind were simulated with real flight crews to assess the potential danger to the operation. The results were encouraging, demonstrating that the maneuver doesn't place an excessive workload on the pilots, and that the concept is viable from a human as well as a technical perspective. So far we've demonstrated the potential aerial refueling holds for civilian aviation, but putting it into practice would still pose challenges. Refueling hubs would need to be established worldwide, shared between airlines. There would need to be fundamental changes to airline pilot training, alongside a wider public acceptance of this departure from traditional flight operations. The Journal for Civil Aviation Training (CAT) is now accepting presentation abstracts for the world's largest aviation training event in the Asia Pacific region. A limited number of speaker slots are available at the 12th APATS event, to be held 15-16 September, 2015, at the Centara Grand Convention Center in Bangkok, Thailand. Over many years the challenges in aviation training have evolved, and increasingly detailed research has helped to develop a better understanding of the issues. Many conferences have provided an excellent platform on which to reveal the type and extent of the problems, but frequently the optimum solutions to these have been more difficult to discern. The challenge for APATS 2015 is to identify and present practical solutions to some of the current headline topics in the aviation training world. The overall theme of APATS 2015 is "Training Solutions". Presentation abstracts are invited to present best practice in the following areas, and the conference will be shaped by those abstracts. 1. Recruit and retain new aviation professionals? 2. Select ab intio pilots, experienced crews and captains? 3. Adapt to cultural issues in the cockpit? 5. Ensure that ICAO Level 4 Aviation English is properly examined? 6. Train to improve situational awareness? 7. Implement Evidence Based Training? 8. Train for Upset Prevention and Recovery? 9. Train to deal with lithium battery fires? 10. Deliver balanced assertiveness training for cabin crew? Preference will be given to air carriers and training organisations with real world insights and "Lessons Learned" information. In no case will sales presentations be accepted. Actual presentations must fit into the APATS format which is 20 minutes, followed by a Q&A period. Longer presentations may be accepted if an in-depth explanation is required. In each case we are looking for two or three clear take-away ideas, so that those who deliver training, or who need certain capabilities can leave the conference with some specific plans to improve training. To propose a presentation for the APATS conference, please send a maximum 200 word abstract by 30th April, 2015. Abstracts are required to be accompanied by a short biography of the speaker which should include contact information, titles, positions and employers, academic background and any conference presentation experience. Authors of accepted speaker proposals will be notified by 31st May, 2015. Abstracts can be sent to Chris Long, Conference Chair, at chris.long@halldale.com. File a copy to fiona@halldale.com and put "APATS 2015 ABSTRACT" in the subject block. Hotel Reservations: *Hotel cutoff date has been extended one more week. * Tour of Boeing's Boeing South Carolina Facility. In Charleston, Boeing fabricates, assembles and installs systems for aft (rear) fuselage sections of the Boeing 787 Dreamliner and joins and integrates midbody fuselage sections. The site is also home to the company's newest 787 Dreamliner final assembly and delivery facility. * OSHA Discussion - Updates and discussion on topics affecting each one of us. Should you have any questions, please contact Tammy Washington, NSC Staff Representative at tammy.washington@nsc.org or 630-775-2227. Organization (ICAO) and the Latin America and Caribbean Air Transport Association - ALTA, will be sponsoring the 6th Pan American Aviation Safety Summit and the 8th RASG-PA Annual Plenary Meeting. This year the Summit will be held June 22-26th in Medellin, Colombia at the Intercontinental Medellin Hotel. (*Please note that these are separate but identical 5-day courses. The course program is the same in each location, with minor differences in course content reflecting participant experience and goals). Please note that completion of this training course is recognised by EAAP as contributing towards certification requirements for those wishing to become an EAAP-certified Aviation Psychologist or Human Factors Specialist. The experienced team of Dr Rob Lee, Kristina Pollack and Brent Hayward will conduct these courses on behalf of EAAP. The first of these was conducted by the same team at Ispra, Italy in 1999, and since then the course has been held regularly in locations including Luxembourg, Stockholm, Madrid, Lisbon, Interlaken, Dublin, Dubai and Barcelona, with a total of more than 400 participants attending to date. As detailed in the Registration Brochures, EAAP members are offered reduced registration fees for the course, and there is also a significant additional "Early Bird" discount for those who register by 15 April 2015. Course participant numbers are limited, so those wishing to attend are encouraged to register as soon as possible. A wide-body jet is nearly lost in the Pacific Ocean, the cause: unknown. Since there was no accident, National Transportation Safety Board (NTSB) management decides against an investigation. "Yes, this book put me right back into those days at the NTSB. It is by far the most realistic rendering of how aviation accident investigations are handled, the politics, the pressures, the infighting. And how there are still some dedicated, heroic and unsung heroes in those agencies, fighting the good fight to make air transportation as safe as possible for the flying public."